"Do you want to BE Somebody or do you want to DO Something Great?" "Do you want to BE somebody or DO something great?" Congratulations on your interest in a program that is designed to bring you into personal and team excellence. That being said it is the effort that you display in making the learning experiences your own that will ensure success. You are the judge on the programs effectiveness. You can fool others but you cannot fool yourself. You will be challenged yet it is always the individual’s responsibility to “own” their learning experiences. In life you will always be challenged to take the easy way out. Many follow the path of least resistance and in so doing they cheat themselves out of real personal growth and learning. In a nutshell, the “Maveriks” Program is all about creating opportunities for personal growth and holistic success. Success is doing ones personal best. Your personal best compared to someone else’s personal best is not a fair or wise comparison. This is because we all come with unique gifts and strengths and it would be ludicrous to compare one person to another. We are all made in the image of God yet all are different. You only have to look at the unique fingerprint that is given to each to recognize this truth. The world in which we are born does not want you to be successful…we will not conform to this…our passion is to see each person perform at their personal best. 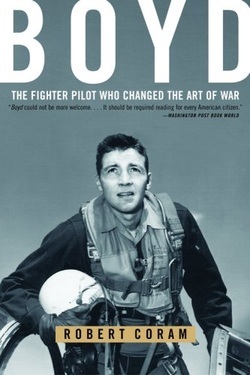 Col. John Boyd never got to BE a General in the Air Force...but he did DO amazing things that has left a powerful legacy...like changing one of the biggest bureaucracies in the world...the US Military! It was his challenge to all those he touched to make the choice...BE or DO!